Sam Winchester: I think it’s a temporal paradox. We pulled Dad here from 2003, right? So time is self-correcting. Our timeline is changing to this new one. Dean Winchester: So, what do you mean? 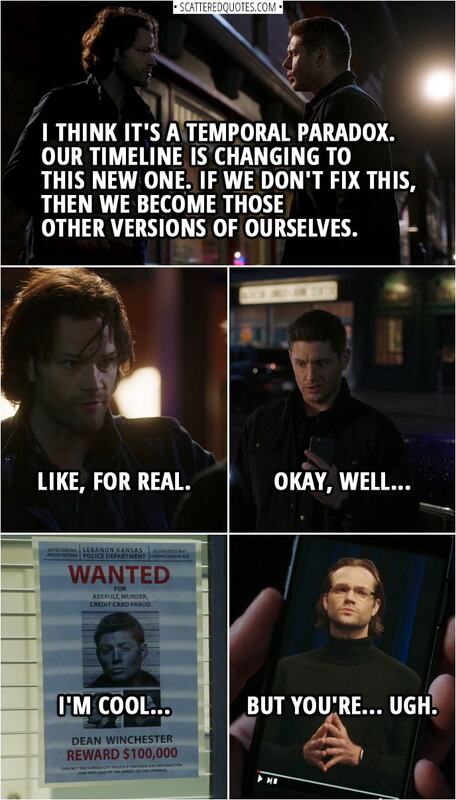 Sam Winchester: It means, I think, that, if we don’t fix this, then we become those other versions of ourselves. Like, for real. Dean Winchester: Okay, well, I’m cool, but you’re… ugh. 11.2.2019 I’m cool, but you’re… ugh.